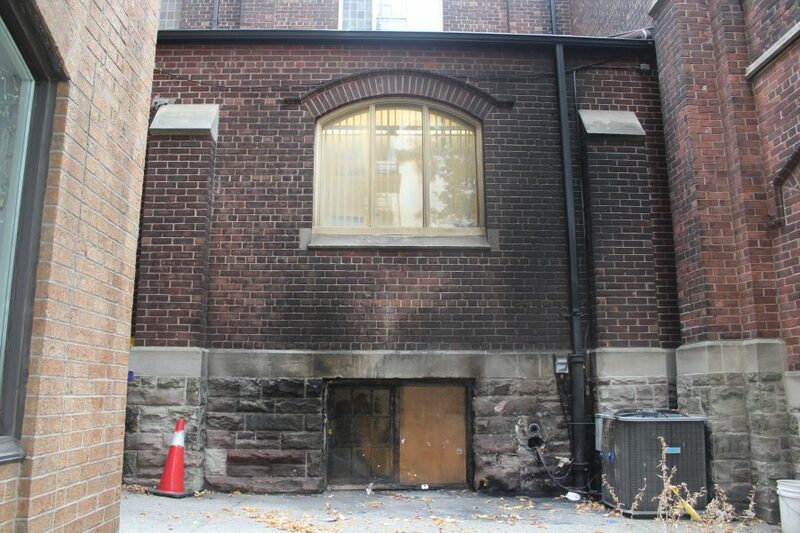 Hope United Church worship leader Brian Stevens is giving thanks to whoever reported a fire outside the church around midnight on Sept. 22 that caused damage he estimated could cost $20,000 to repair. “We have to express a really huge thank-you. We don’t know who called the fire in, but we just want to say thank you because they saved our building,” Stevens said. Toronto Fire Services said pumper 226 responded to a call at 11:25 p.m. about a garbage can on fire outside the Main and Danforth church and arrived on the scene five minutes later. Stevens commended the fire station’s quick response to the fire at 2550 Danforth Ave. The cause of the fire, which engulfed recycling bins by the church’s entrance facing Danforth, is unknown, said fire services. “Who knows what gets thrown in the garbage? Is it malicious? Who knows?” said, Capt. David Eckerman, a Toronto Fire Services spokesperson. “Just for a garbage can they wouldn’t really do an investigation,” said Eckerman. The Ontario Fire Marshal is notified of fires that incur property damages of over $500,000. Stevens said the fire destroyed the church’s air conditioner, cooling unit, and furnace. The furnace room, connected outside by pipes, will have to be gutted, and donations for the Christmas yard sale stored in an adjoining room need to be thrown out because of smoke damage. “It’s really unfortunate because people are very kind with donations,” he said. The damage could have been much worse, he said. “We dodged a bullet… there’s a basement window that held. The fire went up the side, just the façade of the building,” Stevens said. “Luckily it didn’t enter into the building or else we would’ve lost the building,” he added. Stevens suggested the fire might have been an act of vandalism. “We don’t know how it started, but the ferocity of the fire makes us a little suspicious,” he said. The worship leader is encouraging local residents to make sure their garbage and recycling is secured. He suggested the Danforth Village church would be stepping up security but keeping its doors open to the community. “Yeah, we’re frustrated, but we also have that sense of turning the other cheek,” said Stevens.